When it comes to latest flying saucer “sightings” reported to Welsh police, it seems ewe couldn’t make it up. Because an alert about alien SHEEP abduction was among the calls about UFOs received by one force over the past four years. 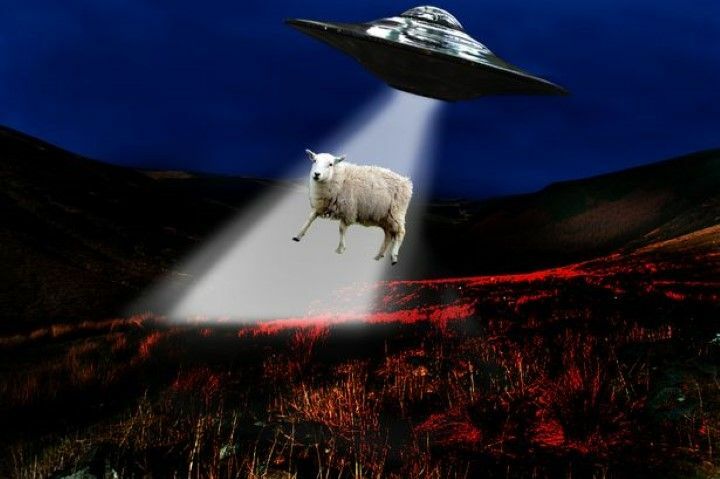 Newly released data shows that a caller to Dyfed-Powys Police claimed they had seen sheep being taken on board an unidentified flying object from a field in Llanybydder, near Lampeter. In the same year, 2011, a caller from Aberystwyth reported they were previously abducted by aliens, experimented on, then returned to earth. Elsewhere in the force’s UFO files, in Llandysul someone reported seeing a triangular-shaped object about 40ft in the air with orange lights and in Welshpool a caller reported seeing a UFO “dropping in the distance”. In 2012 a caller from Carmarthen claimed they saw “a metallic and circular object in the sky”. There were two reports of UFOs last year. A Carmarthen caller reported seeing three objects “the size of a small house” 200-300ft in the sky. And there were reports of a UFO moving erratically in Crickhowell also in 2013. It brings the total number of UFO sightings reported to the force area – which is home to a sightings hotspot once dubbed “the Welsh triangle – to 27 since 2002. Among the earlier sightings, a UFO was reported in the Aberdyfi Estuary by a caller who claimed his car engine stopped when he saw it. The driver escaped without harm. UFOs were also seen at New Quay, Ffrwdgrech, Brecon, Cardigan and Llanelli. In 2009 a “large orange sphere in the sky” in Glanamman, Ammanford, was later confirmed to be a Chinese lantern.